Thomas Hamilton walked into Dunblane Primary School, near Stirling, Scotland on March 13 1996, armed with four legally-owned handguns and over 700 rounds of ammunition. In three to four terrible minutes, he fired 105 shots killing 16 children and their teacher, and wounding 15 more children. His last shot killed himself. In the 20 years since Dunblane, a great deal has been learned about preventing gun violence. Only the United States, where mass shootings now number in the hundreds, seems reluctant to embrace those lessons, prompting president Barack Obama to wonder why the US could not do more on gun control. After the Dunblane massacre, handgun control became highly political. Handgun ownership was increasing in the 1990s and sports shooting, the only legitimate reason for owning a handgun, was a fast growing sport. Yet even members of the elite country-sports lobby were troubled by newcomers, keen on “combat style” shooting, entering the sport. These tensions opened up after Dunblane. The government commissioned Lord Cullen run an inquiry into the incident. He recommended cautious compromises (storing firearms in secure armouries or police stations). These were initially rejected as “unworkable” by shooters, but they were ultimately overwhelmed by the strength of public feeling. Arguing that Britain’s developing gun culture was responsible for the tragedy of Dunblane, the Snowdrop campaign presented a 750,000 signature petition to the UK parliament. The government of the time, under the premiership of John Major, was split, reluctant to confront pro-gun Tory backbenchers, although Tony Blair’s New Labour was waiting in the wings, ready to seize the issue. The then home secretary Michael Howard initially wanted to accept Cullen’s compromise. 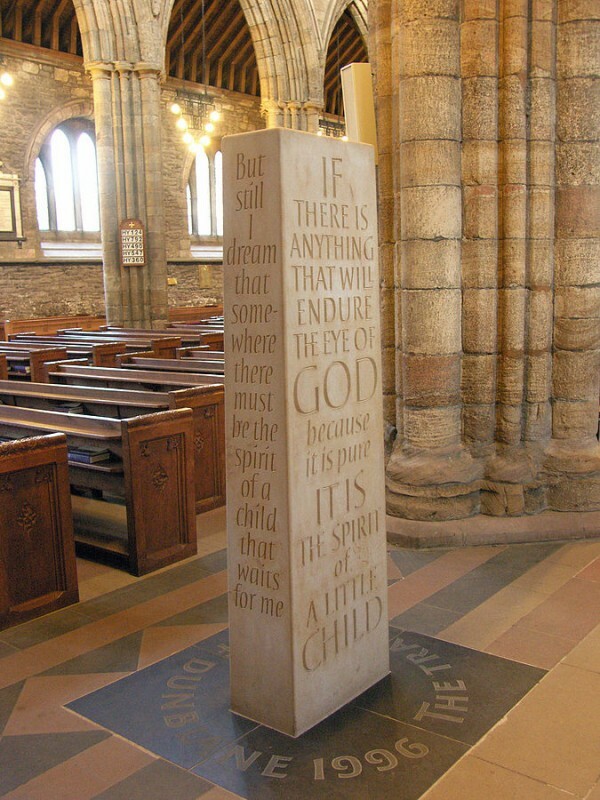 But the Scottish secretary, Michael Forsythe, MP for Dunblane’s neighbouring constituency of Stirling, with one of the smallest parliamentary majorities, had made commitments to bereaved family members. Eventually the prime minister supported Forsythe and backed the handgun control proposals. The Conservative government legislated to ban higher calibre handguns in 1997. After the New Labour government swept to power that May, it added .22 calibre handguns to the prohibited list. A Home Office analysis cited by Cullen had found that, between 1992-94, 14% of firearm homicides had been committed with legally held weapons. 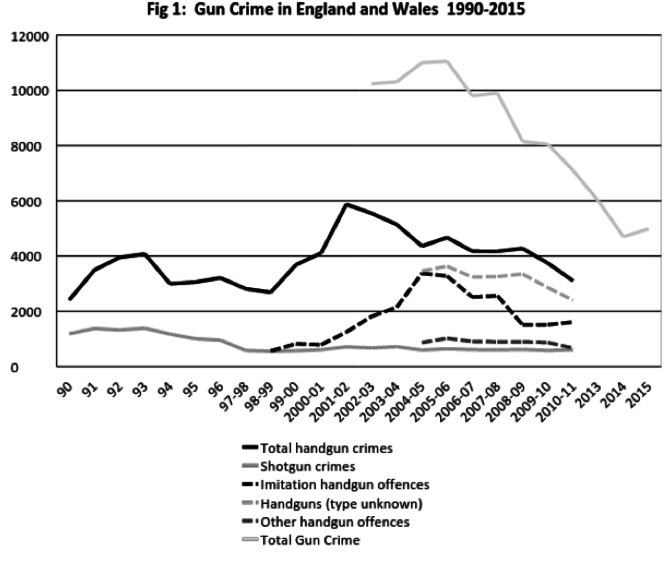 Even allowing for some slippage of weapons from legal to illegal ownership and stolen firearms, nobody expected that the surrender of legal handguns would hugely impact the rates of gun enabled crime. But few expected the 105% increase in recorded handgun crime which occurred between 1998 and 2003. In Scotland, handgun offences fell by almost 80% in the five years after Dunblane. As any criminologists would stress, passing a law does not in itself prevent crime. Rather more was happening, for the 1990s saw the development of a wholly new gun market in the UK comprising non-firing “realistic imitation” firearms (hitherto largely unknown in the UK), BB guns, and high-powered air weapons. There was a ready demand for many of these “junk guns” in Britain’s emerging gang cultures, where firearm carrying was culturally endorsed. Researchers found that a large proportion of “armed robberies” were carried out by offenders with imitation or non-functioning firearms. The rise in handgun crime had nothing to do with the handgun ban and everything to do with the changing patterns of supply and demand in the illegal firearms market. In some respects, displacement of firearm demand into the multi-layered “junk firearm” market could also be seen as a sign of success – offenders were finding factory quality weapons harder to come by. 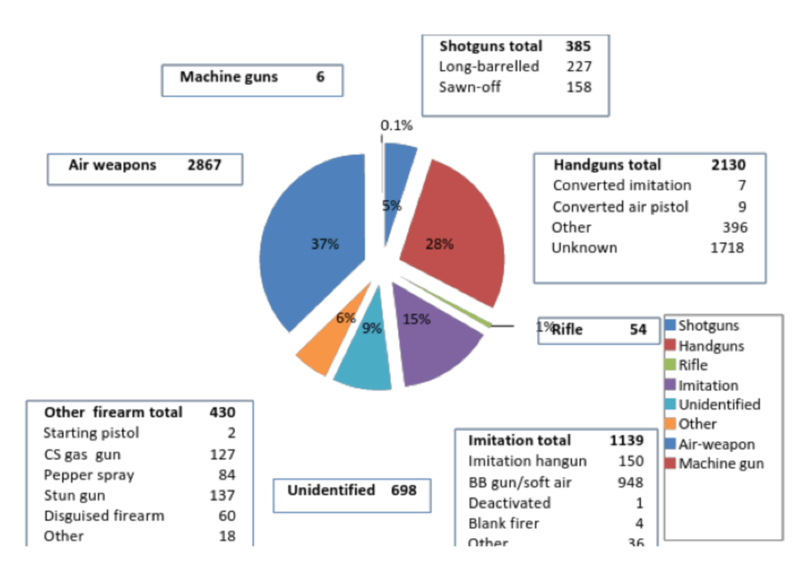 In turn, both the police and Home Office began to develop a more sophisticated understanding of the composition of Britain’s illegal firearm supply. 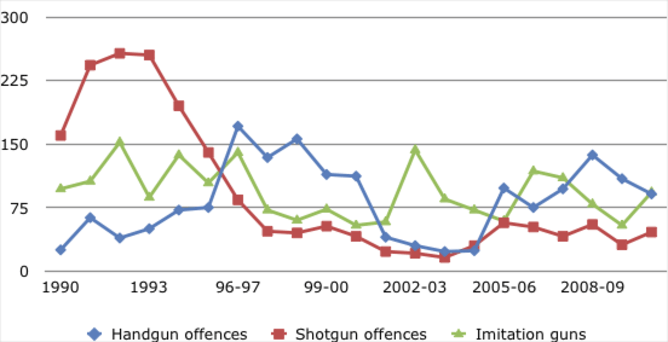 As the graph above shows, from around 2003 the gun crime graph picks out the contribution of different firearm types. The pie chart below shows the full variety of firearms making up the criminal armoury – guns recovered by the police in England and Wales in 2014. A large number of firearms remain unknown or unidentified. In the face of some of the world’s toughest gun control laws, criminal ingenuity has worked to create new supply routes into Britain to meet criminal demand, even as local intelligence-led policing has sought to suppress the demand for firearms in “gang affected” communities. The National Ballistic Intelligence Service has contributed enormously to our understanding of the supply, circulation and misuse of criminal firearms. New types of gun supply have arisen offering converted or “reactivated” firearms, recycled antique weapons or ammunition. Meanwhile, smugglers, the internet and the UK fast-parcel service have all played a part in arming Britain’s criminals. The authorities in the UK are now considering how to prepare for new threats, such as the Paris style “mass casualty” attacks. Her Majesty’s Inspectorate of Constabulary has recently published a hard-hitting report recommending further important changes to British firearms licensing, for instance by requiring better information sharing between police and community mental health teams and a more rigorous vetting of firearm license applicants. Dunblane represented an almost unprecedented challenge to British understandings of the public safety issues presented by firearms. Effective research, diligent lobbying by the UK Gun Control Network, new legislation and new policing practices have made substantial progress on the problems. But the answers did not come all at once and, as the uptick in gun crime figures for 2015 suggests, there are no grounds for complacency. Peter Squires is a Professor of Criminology & Public Policy, University of Brighton. Visit his web site here. This article was originally published on The Conversation. Read the original article.